In episode one of the Collector’s Clubhouse wee talked about the enjoyment of collecting and the nostalgia and fun that collecting brings to following sports. Episode two focused on the financial side of collecting, the opportunities for collecting as an investment. Last week I promised to delve into this second concept in more depth. So, that’s exactly what we are going to do. I said last week that collectibles can be thought of like the stock market. There is one really big difference between the stock market and collectibles however. When you buy stock you know exactly what stock you are buying. The price changes depending on a number of factors but if you go buy 100 shares of Apple stock you will receive 100 shares of Apple stock. You can buy collectibles this way (buying single cards after market, purchasing autographed balls, jerseys, etc.) but for the most part this is not the way collectibles are packaged by the manufacturer. Ever since the first wax packs were produced decades ago (gum included!) sports cards have been sold in “packs”, groups of cards in various numbers (usually around 10-12) that are sealed in a wrapper. You won’t know what you bought until after the fact. A monster hit worth way more than the price of the pack. In my opinion, this is one of the real true joys of collecting. 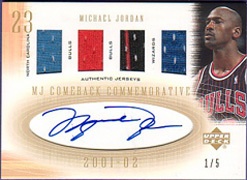 You never now when you’re going to open a pack of Upper Deck basketball and pull a Michael Jordan autographed patch card serial numbered /5. In the business this kind of hit is called a BOOM!!!!! (typically with the all caps and exclamation points included, collectors are excitable people). Pulling something big from a pack is the quickest way to end up profitable in collecting. You don’t have to hit a monster like the Jordan to end up with more value than the cost of the pack/box you purchased. Sometimes, it may take a few years for that value to be realized (think about the 2011 Topps Update example from episode 2). Of course you won’t always end up with a successful break and there will be times where you’ll open a product and end up with less than you paid. However, if you can keep your losses small when they happen (I’ll talk about that in the coming weeks) when you hit big it’ll put you on the plus side. Even if the number of times you “lose” outweigh the number of times you “win”. I hope that all makes sense. If not I’ll be getting more into the specifics soon. 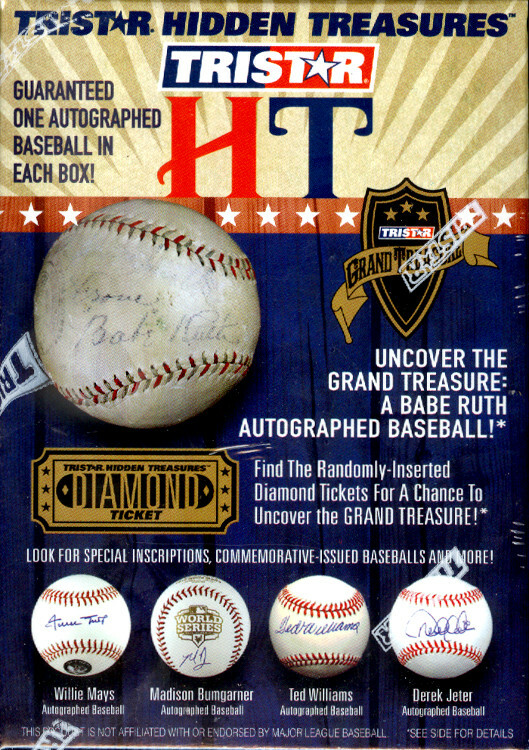 An example of boxed autographed baseballs. jerseys, etc.) in sealed packaging. So if you don’t like the idea of paying $300 for a Mike Trout autographed baseball you can pick up a 2015 Tristar Hidden Treasures box instead. Maybe you end up with a Mike Trout and your $75 investment turns into $300. Or maybe you end up with a ball only worth $50. But, again, if you keep those losses small eventually when you do hit it’ll be a big profit. Which brings us to the idea of “group breaks”. Group breaks are a really fun and economical idea. Instead of one person having to float the cost of an entire box of cards or case (cases are how manufacturers package boxes, so a case may have 5, 10, or even 20 boxes) of cards, a group of collectors can share that cost. A few common ways to spit up a group break include by teams, divisions, or hits (example, if there are 10 hits, autographs or game used cards, then those would be split up among the breakers in the group). This allows each group member to lower their overhead costs and allows them to have a chance at bigger profit for less cost. Again, you won’t always “hit” but it’s a lot of fun and the costs are much lower. Plus, it’s a great way to get a chance to interact with other collectors. Those are the basics of breaking and next week we will talk more in depth about the other side of collecting, singles and how to buy and sell them for investment. Another reminder about our Cleat Geek only group break with free stuff! We’ve pulled a box of 2015 Leaf Ultimate Draft out of our store and are offering spots to Cleat Geeks readers only. That’s 5 cards, all autographed, one card per slot. AND each slot will get a bonus grab bag courtesy of Cleat Geeks. We will continue to do these kinds of special Cleat Geeks reader only opportunities as a thank you for being a part of the Cleat Geeks readership. Stay tuned as we have some fun stuff planned to commemorate the start of the MLB playoffs and the upcoming NHL season. If you want in on the 2015 Leaf Ultimate Draft break you must email us at majesticcardbreaks@gmail.com and tell us you read about it on Cleat Geeks. Last but not least we’ve got our collecting picks for tonight’s Thursday Night Football match up between the Baltimore Ravens and the Pittsburgh Steelers. Let’s start with the Ravens who have seen a lot of turnover on offense around Joe Flacco recently. While Justin Forsett had his coming out party last season I’m not convinced that his value holds moving forward. I’m not seeing the overall success or the media hype that is required for collecting values to rise for the, to this point, journeyman running back. A young, potential star in the making I do have my eye on is Breshad Perriman. More than likely this will be Steve Smith Sr.’s last NFL season and there is a dearth of pass catching talent behind him on the Ravens’ depth chart. Perriman is the one receiver who appears to have the skills required to be a #1 in the NFL. Don’t let his injury woes deter you as they only drive his current price down. Once he gets healthy and starts to see the field, production will follow. Perriman is a buy. The Pittsburgh Steelers are an interesting team that is full of older players or young players whose star has already brightened. Big Ben is a national star as is now the case for Antonio Brown and Le’Veon Bell too. In general offensive players are always more hyped (and therefore more pricey) than defensive players. Throughout the years though there have been defensive starts that have transcended the typical defensive player valuations. I think Ryan Shazier (if he can say healthy) could be one of those players. In a market like Pittsburgh with a rich defensive legacy Shazier could become a star. He doesn’t have the Polamalu hair but he could be a Ray Lewis type who becomes a household name at the inside linebacker position. I would recommend Shazier as a buy but keep your exposure small. That’s all I’ve got for today. Thanks for reading and happy collecting!